Breed Group: Sporting Weight: 36 kgs Height: 61 cms Color(s): various shades of gold Coat: The Golden Retriever has a double coat that is water repellent and weather resistant. The outer coat is firm, resilient, and can be wavy or straight. The tail and legs are feathered with longer hair. The under coat is dense and soft in texture. The coat color is rich, lustrous, and varies in shades of cream to gold. Distinct feature: The Golden Retriever is a gorgeous, large, and energetic breed. They are the world's foremost family pet and companion. They are sturdy, well proportioned, and are well known for their hunting capabilities on land and in the water. The Golden is perceptive and agile. 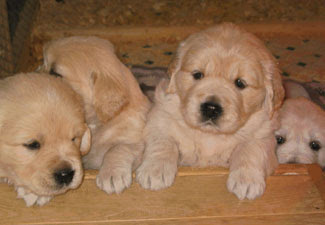 Temperament: Golden Retrievers are loveable, polite, and highly intelligent. They exude charm and confidence. They are sweet, eager to please, and devoted family companions. They do not do well if left alone for extended periods of time or they will become mischievous and destructive. They have a tendency to be overly exuberant and distractible. They are always gentle and patient with children. They are friendly with other pets. In fact, they are friendly with everyone. They tend to bark as a form of greeting. Activity: The Golden Retriever requires daily exercise. They enjoy play sessions with their family, retrieving balls and other toys. They will do okay in an apartment dwelling provided they are sufficiently exercised. Golden Retrievers are moderately active indoors and does best with a medium to large sized securely fenced yard.